Whew! Let me wipe the sweat from my brow and take off these nasty garden gloves and we'll get on with exploring this week in the garden. It's no fluke that it's hot. In fact, the period from July 27 through August 20 is historically the hottest part of the summer in these parts. So far, it is living up to its reputation. I have to pick my moments carefully in order to get work done in the garden now. For most of the day, it is pretty unbearable out there. The best time of day to work would be early in the morning, but I'm a late-to-bed, late-to-rise kind of person and I don't seem to be able to change that habit, so I lose the optimum time for gardening. My strategy is to work in small increments of time throughout the day and to spend my largest chunk of time outside in the late afternoon, when things have cooled off a bit. In this way, I've actually managed to accomplish quite a bit this week. Last week, I worked mostly in the front yard, so this week has been spent in the backyard - weeding, deadheading, pruning, replenishing mulch, and, of course, watering. It is the never-ending cycle of the gardener. I confess I love it! When things get really hot, we quickly learn which plants have the mettle to take the heat and keep on performing. Here are some of this week's winners. Throughout the summer and, in fact, throughout most of the year, the yellow cestrum brightens the garden with its yellow blossoms. 'Pride of Barbados' continues to send out blooms in spite of the heat. And out by the goldfish pond, the jatropha sports its bright, tropical flowers. 'Belinda's Dream' is, of course, a dependable bloomer throughout much of the year. I have daylilies that bloom early, midseason, and late. This is one of the midseason varieties. The white "cat's whiskers" are blooming well, but the purple variety has so far been a disappointment. The variegated abelia has lots of these pretty little blooms. It lives in a bed with the 'Tropicannas' which are grown mostly for their colorful foliage, although they also have bright orange blooms. The native beautyberries have produced an abundance of berries this year, which will make the birds happy. The berries are now turning purple, signifying they are ripe. I also have one of the white-berried specimens, but, for some reason, it doesn't seem to be doing as well this year. Of course, it's not just the plants and the gardener who have to learn to tolerate the heat. There are other critters in the yard who must deal with our climate. The green anoles, for example. This year's baby green anoles have just hatched. Everywhere I turn these days I seem to encounter one of the tiny creatures, some of them just two-and-a- half or three inches long, obviously just out of the egg. The adult anoles are seldom seen at this time of year, but when it gets just a bit cooler, they will be back, too. And then there is the backyard box turtle, Sammy. Sammy still turns up most every day on the back porch looking for his dry kibble handout. Perhaps that's one of the way he copes with the heat. He doesn't have to work up a sweat looking for food because he knows where he can dependably find it! Every time I see this little turtle he seems to have sustained a little more damage to his shell. It must be a tough world out there for box turtles. I do enjoy sitting on my patio at the end of the day as activity in the garden winds down and the sun sets behind my neighbors' trees to the west. The frenetic activity of the birds slows down until, usually, the only birds left at the feeders are the cardinals who like to get in one last snack before sunset. The hummingbirds, too, whiz around, visiting all the flowers and storing up energy for their high metabolism bodies to get through the night. Things get quieter. The southern breeze ruffles the leaves and the sun slowly sinks. The sun sinks a little earlier and a little farther south each day. A month ago, it set on the north side of a particular large pine tree in my line of vision. Now it has passed all the way to the south side of the tree's trunk and in another month it probably will have made the trek all the way to the next tree in the line. By the time the winter solstice arrives, it will have passed far enough south to be out of my direct view when it sets. And so we mark the passage of time, our journey through another year. I have a birthday coming up soon, so the passage of time is on my mind. But it is not a sad thing. Everything has its season and the season yet to come is maybe the best one of the year for us. Autumn - something to look forward to during the hot, miserable days of August. Dorothy, only 28 days till September! It is interesting to see the progress of the beauty berry. Ours are still in bloom and just forming berries. Even 150 miles of north-south distance is telling. Everything looks great in your garden, As usual! It's amazing how even a relatively small distance does make a difference in a plant's development. Summer is the best season here, spring and fall get cold and rainy, so I have to enjoy it now. Spring and fall were always my favorite seasons in Houston. I commiserate with you over the heat. I grew up there with no air conditioning. Your flowers look beautiful anyway, I covet the Prince of Barbados. I bet it wouldn't grow here. I think autumn is really my favorite, maybe because it is just such a relief after suffering through July and August and most of September. I don't even want to think about surviving them without air conditioning! Enjoy your pleasant summer. I'm with you Dorothy, soooo looking forward to autumn. I actually decided to attempt to grow a whole bunch of annual color for this season...just keeping it wet while it all germinated is daunting. A/C for me too!! Now I've read about this Aftrican Dust that has settled over us here...huhhhhh like we needed that one! 103 today, the weatherman is saying. Guess I'll settle down inside with a good book for much of the day. And dream of October. Love this post! That beautyberry's a . . . shall I say it? A beauty! I appreciate how you notice the life in your garden, the anoles, the butterflies, the birds, flowers, and Sammy, despite the torrid weather. Autumn really is such a lovely thought, isn't it? 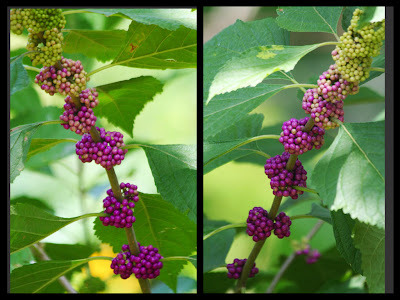 Beautyberry is a favorite of mine and the birds, and sharing the garden with Nature's creatures is what gardening is all about for me.